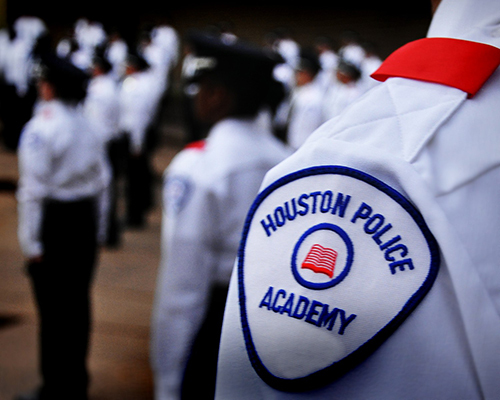 The Houston Police Department’s Training Academy prepares cadets for a career in law enforcement through a rigorous six month academic and physical training program. Cadets receive a salary while attending the academy. Cadets do not live at the academy but travel back and forth for training each day, Monday through Friday. Due to the intensive training program, cadets are not allowed to hold other types of employment or attend other educational classes while attending the academy. The Houston Police Department’s Training Academy is located at 17000 Aldine Westfield Road, Houston, TX 77073. Upon graduation, all new officers are on probation for six months and are assigned to the Field Training Officer (FTO) Program for 12 to 16 weeks. A police officer's first duty assignment is as a patrol officer.